(b) links to website or location of fact checks published in the previous three months. PT Kompas Cyber Media merupakan perusahaan media online yang seluruhnya dimiliki oleh grup Kompas Gramedia. Grup Kompas Gramedia didirikan oleh Jakob Oetama dan PK Ojong. Informasi mengenai Kompas Gramedia bisa dilihat di https://id.wikipedia.org/wiki/Kompas_Gramedia. Pengeluaran Kompas.com adalah untuk biaya karyawan di divisi editorial, bisnis, dan support functions, biaya event, biaya maintenance server dan pengembangan teknologi di bawah PT Kompas Cyber Media sebagai perusahaan berbadan hukum (Nomor TDP 09.05.1.73.37957) dengan izin usaha SIUP Nomor 00573/24.1.0/31.71-7.1001/1.824.271/2015. Pengeluaran Kompas.com seluruhnya didanai oleh pendapatan dari bisnis advertising, event production, dan content marketing. → Evidence required from signatory: A brief explanation (500 words max) of how sources are provided in enough detail that readers could replicate the fact check. If the signatory has a policy on sources, it should be shared here. (b) link to the page where readers can submit claims to fact-check. I see more progress in transparency of funding. The media organization published its 2018-budget plan on fact-checking work and reader can see the budget availaibe online here: https://inside.kompas.com/about-us. An issue for further improvement is online references items for readers to replicate the fact-ckeck. Progress is satisfactory but recommend improvement for future applications. Concerning there is no more serious issues, I recommend to accept Kompas. Overall, Kompas.com is mostly compliant with the principles of fact-check. The outlet produces fact-checking as part of their editorial process and the link on it namely ’TOPIK KITA’ is easily accessible: https://indeks.kompas.com/topik-pilihan/list/4390/berita.viral.hoaks.atau.fakta. Small improvement should be made, i.e. to detail publication of funding incomes as matter of transparency and to frequently provide readers with links/contacts to the primary sources of a story being checked (if available). As the two improvements above are not big issues that affect trustworthiness of the Kompas as fact-checker, I propose to accept the Kompas.com application with minor editing in the application form. Kompas.com is legally reviewed and registered by Indonesian Press Council as online news platform (see: a capture of http://dewanpers.or.id/perusahaan). It is part of Kompas Gramedia Group (KKG), a huge media company in Indonesia (see: http://www.meetkcm.com). The fact-checking job is a part of its daily editorial process. In addition, Kompas.com is a registered commercial entity namely PT Kompas Cyber Media with no. TDP 09.05.1.73.37957 and having a letter of business license no. 00573/24.1.0/31.71-7.1001/1.824.271/2015 (see: http://inside.kompas.com/about-us#legal). done_all 1a marked as Fully compliant by Masduki. To the link: TOPIK PILIHAN, the outlet published many of the selected stories which can be considered as fact-checking work that easily accessible for reader. Readers can easily click a specific symbol at the middle-right side of the Web namely: HOAKS ATAU FAKTA. In addition, Kompas.com declare its fact-checking job at the bottom of the story (see attached). done_all 1b marked as Fully compliant by Masduki. From link: http://indeks.kompas.com/topik-pilihan/list/4390/news.atau.hoax, I can say, the choices of fact checks seem to be covered various social, economy, entertainment and political issues not only happened in Indonesia but also outside the country. In this link: http://inside.kompas.com/about-us#metodologi, Kompas.com describes how the verification process of selected claims is based on several steps, among other to apply research from many sources, field visit, and verification of data by confirming the competent sources. The current data coming from social media platforms as for instance would be carefully tested. In addition, Kompas.com is also supported by an internal research body namely LITBANG KOMPAS which regularly examining the public issues and providing analysis of the current stories of Kompas.com. In addition, the outlet has cooperation with TurnBackHoax.id which public can report the viral issues to be examined. done_all 2a marked as Fully compliant by Masduki. Kompas.com has a specific policy to prohibit both company and employees from practical political activities. The policy meets the national code of ethics (managed by Indonesian Press Council) namely Kode Etik Media Cyber. The outlet has some experiences to terminate its staffs entering political party or became a state official of Indonesia to protect its independence. Conduct political propaganda both oral and/or written. Use or attach and/or distribute any attributes of the political party, including: Jackets, Clothing, flags, pins, pamphlets, leaflets, marks/flyers, slogan or other signs related to political activities. Supporting a political activity by using and/or utilizing the facilities and or assets of the company, among others: official vehicles, telephones, facsimiles, letters, logos, etc. Moreover, the link: http://inside.kompas.com/kode-etik-jurnalistik ensures Kompas.com adoption of the Indonesian code of journalism ethics. done_all 2b marked as Fully compliant by Masduki. For data, Kompas.com make sure the data produced comes from a credible official source, whether a government agency or an international institution. Kompas.com is also supported by independent research institute namely LITBANG KOMPAS which for decades tested with objective, valid, and independent data. In each of the published articles, Kompas.com links the stories to its previous relevant stories by stating the name of person/institution and marking them by a specific color where public can deepening the information. In particular, Kompas.com link the fact-checked story with short information on the method of fact-check as can be seen in the attachment. Links to primary source such as government reports that allow reader to access first hand of data is not always available directly inside the story. On this issue, to its additional information (see attachment), Kompas.com refers to a general norm of journalism ethics by protecting/hiding personal information such contact number of source or an official data of a particular critical topic so that no party is harmed by the news publication. However, for a story coming from the official event or official statement of government, the source identity/original data may be accessed directly through a particular site of the source mentioned in most of the Kompas.com story. done 3a marked as Partially compliant by Masduki. The link: http://inside.kompas.com/about-us#pendanaan provides general statement of Kompas.com funding from online advertising, event production and content marketing as financial sources which are used to cover costs of editorial employment, providing technical facilities & its maintenance and to support the IT innovation. However, there is no detail report of its money income available for public. In addition, the link: http://www.meetkcm.com (mother of Kompas.com) does not allow reader to directly access a full report of Kompas.com funding. done_all 4a marked as Fully compliant by Masduki. All key actors of ‘the Bunkers’ acting as Kompas.com fact-checking team are listed online (see: https://inside.kompas.com/kode-etik-jurnalistik) with direct link to their detail biography that easily accessible. The team is headed by Wisnu Nugroho, chief editor of Kompas.com and it consists of four senior editors as the member. done_all 4b marked as Fully compliant by Masduki. The outlet provides various forms and links for public to send comments and critics over the published articles or fact-checking issue (see: http://inside.kompas.com/kode-etik-jurnalistik). 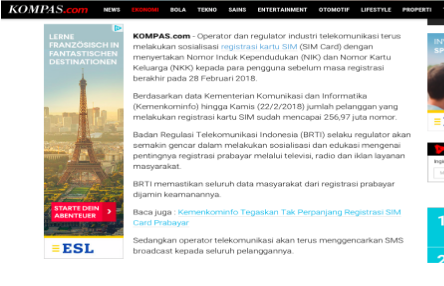 Moreover, at the bottom of the link, reader can see eight choices of clarification methods to Kompas.com together with examples of how Kompas.com reacted over the reader complaints. The information on this matter is obviously provided in the Web. done_all 4c marked as Fully compliant by Masduki. In the page http://inside.kompas.com/about-us#metodologi, the outlet informs a steps by step process on how editors select public issues and provides stories being fact-checked. Although, there is no detail rating/grading formula. done_all 5a marked as Fully compliant by Masduki. Kompas.com provides generic form for public to send claims and discuss to any fact checking or to making clear stories (see: http://inside.kompas.com/about-us#meet). In addition, the organization uses email accounts (redaksikcm@kompas.com, redaksikcm@kompas.id) and social media platforms to receive both reply and correction. See attached. done_all 5b marked as Fully compliant by Masduki. The ‘correction and review’ policy of Kompas.com fully adopts the national cyber-media guidelines (see: http://inside.kompas.com/pedoman). done_all 6a marked as Fully compliant by Masduki. The evidence submitted fully complies with the IFCN requirements, although the articles are not fact checks. done_all 6b marked as Fully compliant by Masduki.